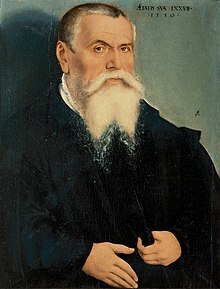 Lucas Cranach the Elder, Portrait at age 77 (oil on panel, 67 × 49 cm)|format= requires |url= (help), Florence, IT: Uffizi Gallery, c. 1550 . Lucas Cranach the Elder (Lucas Cranach der Ältere, c. 1472 – 16 October 1553) wis a German Renaissance penter an prentmakker in widcut an engravin. This page wis last eeditit on 17 Juin 2016, at 23:11.